Our specialty is custom engagement rings. Which means we work with you to create your unique vision. Your vision might be clearly defined, or you might have some ideas and you need some help forming it into the perfect ring. 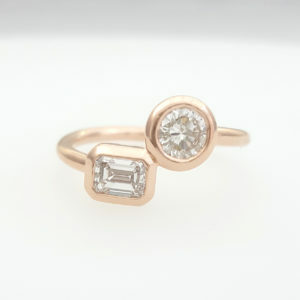 Sometimes only one partner is creating the ring as a surprise and other times the couple comes in together to design a ring. We can help no matter where you are in that spectrum when looking for an engagement ring. 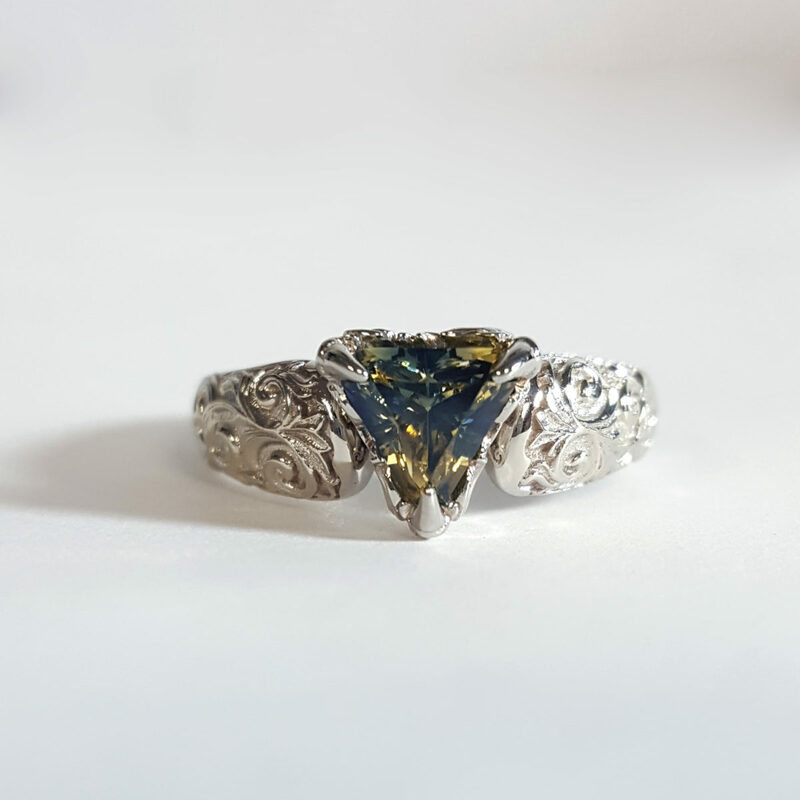 Here are some examples of really unique engagement rings we created that were all designed by one partner as a surprise! These guys really went that extra mile to research and design the perfect rings for their future fiancés. 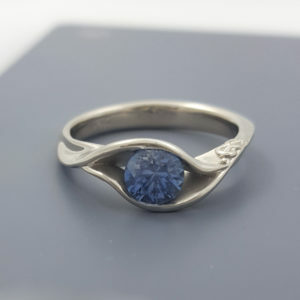 Our client brought in this unique Australian parti sapphire wanting to make a one-of-a-kind engagement ring to propose to his girlfriend. He came equipped with specific examples and pictures of rings he liked, and was able to explain the elements that drew him in. We worked together to design this unique scroll work ring, set with claw-like prongs to hold the calf-cut sapphire. This amazing yellow gold ring was created as a re-design of an engagement ring a couple years after the wedding. The original ring was a simple platinum solitaire with the princess cut diamond. As a surprise, the husband contacted us for an upgrade with some personality, featuring a large lapis, the original princess cut diamond, and diamonds all the way around the band. 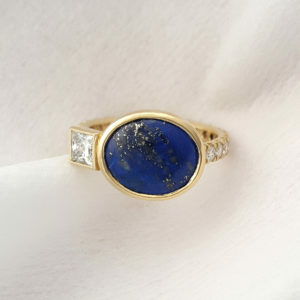 Doesn’t that lapis remind you of a starry night sky? A simple but unique engagement ring featuring an heirloom round brilliant cut diamond and a new emerald cut diamond. This one was actually inspired by a ring that Dustin made for Caroline. 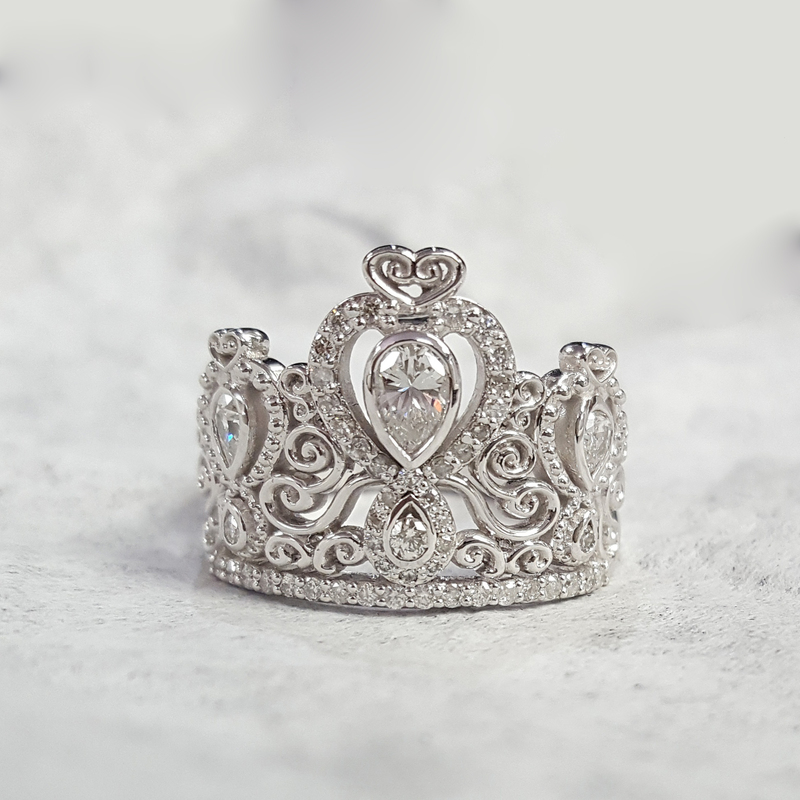 His sister commented on how much she loved it, she mentioned that even though she doesn’t wear a lot of jewelry, she could see herself wearing this one. So when her boyfriend contacted us ready to make an engagement ring, we knew exactly what to do! The round brilliant diamond was one we had in the safe from her beloved grandma, and we found the new emerald cut diamond to complement and balance the asymmetrical design. Thick bezel settings and the bypass full round shank, all in rose gold, keep this ring looking modern, clean, and a little edgy. The groom-to-be who designed this ring wanted something durable, low-profile and represented the couple’s active outdoor lifestyle. He knew she liked light blue and wanted a swirl pattern for the setting of the ring. They used to live in Montana, so a Montana sapphire was the perfect stone for the job. As we were finishing up the design of the ring, he decided to add the little figure-8 knot as a nod to their rock climbing passion. That extra personal touch is everything in this ring! Look at this crown ring. Isn’t it amazing!? This ring needs no description. You know that the guy who designed this white gold diamond ring treats his lady like a queen (Disclaimer – this was a thoughtful gift, not an engagement ring).